Product #46071 | SKU M6KISB | 0.0 (no ratings yet) Thanks for your rating! 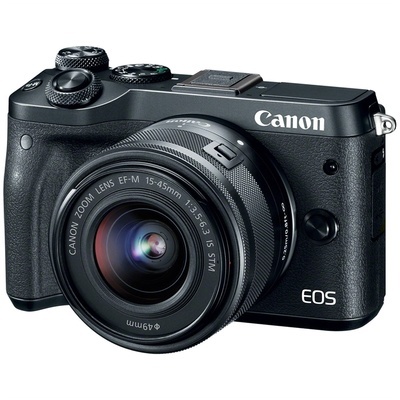 A well-rounded mirrorless camera for both stills and video use, the black EOS M6 from Canon offers apt imaging qualities with a refined, functional physical design. Making use of a 24.2MP APS-C CMOS sensor, both high-resolution stills and Full HD 1080p/60 video can be recorded, while the DIGIC 7 image processor affords a wide expanded sensitivity range from ISO 100-25600, along with quick continuous shooting up to 9 fps. The sensor's design also facilitates Dual Pixel CMOS AF, which uses phase-detection autofocus for quick, accurate, and smooth performance to suit both stills and video use. Additionally, Combination IS 5-axis image stabilisation also helps to realise steady, shake-free recording by minimising the appearance of camera shake.